Byron Bay is known internationally for it’s unique beauty & outstanding beaches. You can see Australia’s most spectacular coastal views of Byron Bay from 14,000 feet, when you skydive with Skydive Byron Bay. Click here for more information. 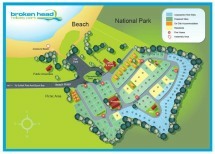 Book at the Broken Head Holiday Park on arrival.